PE4146 TNC male right angle coaxial connector has an interface type of RG213, RG214, RG8, RG9, RG11, RG225, RG393 and a 50 Ohm impedance. Pasternack TNC male connector uses shield/contact clamp/solder as an attachment method. Our male TNC right angle coaxial connector provides a minimum frequency of DC and a maximum frequency of 11 GHz. The Pasternack right angle TNC male coaxial connector has a teflon dielectric type and a VSWR of 1.35. The Pasternack TNC coaxial connector has a brass body with nickel plating. 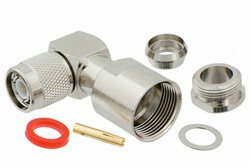 Our PE4146 TNCright angle connector uses brass contact. This TNC male right angle coaxial RF connector is RoHS and REACH compliant. 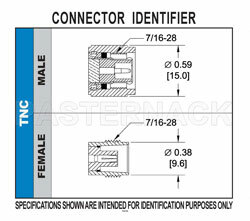 This Pasternack right angle male TNC connector will ship the same day as purchased. Our TNC right angle male connector is part of over 40,000 RF, microwave and millimeter wave components in stock for worldwide shipment. We also build custom TNC connector cable assemblies that will ship the same day as well.